"How can I tell if my dog had a stroke?" That is a question some owners ask when their dog displays some classic symptoms associated with strokes in humans. Learn the signs of a stroke as well as a few conditions that produce symptoms similar to a stroke. A stroke is a condition that interrupts the normal blood flow in the brain, and it can be caused by a ruptured vessel or a blood clot. This results in the death of brain cells, and it can affect your dog in many ways. However, the first thing you need to know is that strokes are far rarer in dogs than they are in people. In most cases, the symptoms that may appear to be caused by a stroke are actually due to some other condition. The good news is that dogs often recover from a stroke far more easily than most people, so it's not a totally hopeless situation if your dog actually does have a stroke. 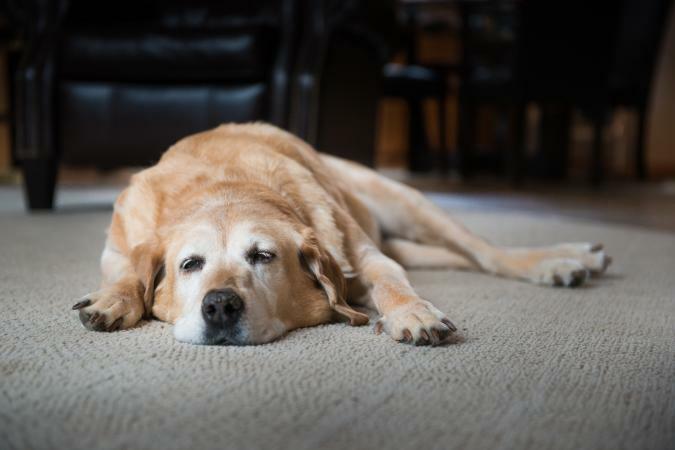 The following signs could be indicators that your dog has had a stroke. Keep in mind that you'll need a proper diagnosis from your vet to determine exactly what's wrong with your pet. Sluggishness - Your dog may suddenly seem too tired to respond to you or perhaps unable to move. Lack of bladder control - A dog may release urine involuntarily during the stroke and remain unable to control his bladder after the event. Lack of bowel control - Similar to a loss of bladder control, a dog may not even be aware that he is releasing his bowels due to a lack of muscle control brought on by brain damage from the stroke. Unable to keep balance - The dog may list to one side or another, or he may be weak and wobbly and even fall over when trying to walk. Head tilt - The dog appears to have its head cocked as though listening with one ear. However, the animal is suffering from a loss of equilibrium, so the head tilt it usually associated with circling and a loss of balance. Paralysis - Dogs often experience some measure of paralysis with a stroke. The dog may lose the use of one or more legs, keeping it from being able to walk. There may also be some facial paralysis that causes drooping of an eye or the jaw, but this symptom is far more common in people than in dogs. Impaired vision - This can be anything from eye problems like blurry vision to complete blindness. If you suspect your dog has had a stroke, the first thing you need to do is take him to the vet for an examination. Your vet will first give your dog a physical exam and make a list of any outward signs. If the signs appear to point toward a possible stroke, your vet will then move on to a neurological exam. This can include an MRI or a CT scan to get a look at what's going on inside your dog's brain. The vet is looking for signs of a blocked artery or an internal bleed. While the signs and symptoms of these conditions can mirror that of a stroke, the only way to tell for sure which is affecting your dog is through imaging tests. Your veterinarian will perform CT scans, MRIs, electrocardiograms, x-rays, and ultrasounds among other tests to make a correct diagnosis. There is actually very little the vet can do to treat a canine stroke once the damage is done. Therefore, vets look for the initial cause of the stroke and treat that cause in order to prevent future strokes from happening. According to the American Animal Hospital Association, most dogs who have suffered from a stroke "have a good outcome" and the quicker you can get your dog to a vet, the more likely they will have a positive result. The prognosis for your individual dog will depend on a variety of factors such as their age, overall health, underlying medical conditions and the intensity of the stroke incident. The majority of dogs that make it through the initial few days of treatment are likely to have a full of close-to-full recovery, although it may include some physical deficits that can be handled through physical therapy and supportive care. You may also notice some neurological and behavioral changes that could be permanent but do not necessarily impact your dog's quality of life. Some veterinarians may suggest the use of aspirin for dogs that have suffered from a stroke. A low-dose of half a milligram per kilogram weight of the dog may be used in some situations to prevent blood clots from forming. However, you should discuss this carefully with your veterinarian as the use of aspirin in dogs for stroke is not widespread and does not have much research to back it up at this time. The list of symptoms above can help you answer the question, "How can I tell if my dog had a stroke?" You'll really need your vet's help to get an official diagnosis and follow up care, so make sure you get your dog to the vet right away.